Remember RapidShare? Once one of the world's most popular and first ever one-click online file hosting and cloud storage website on the Internet. The company has announced that it will shut down its business at the end of next month. 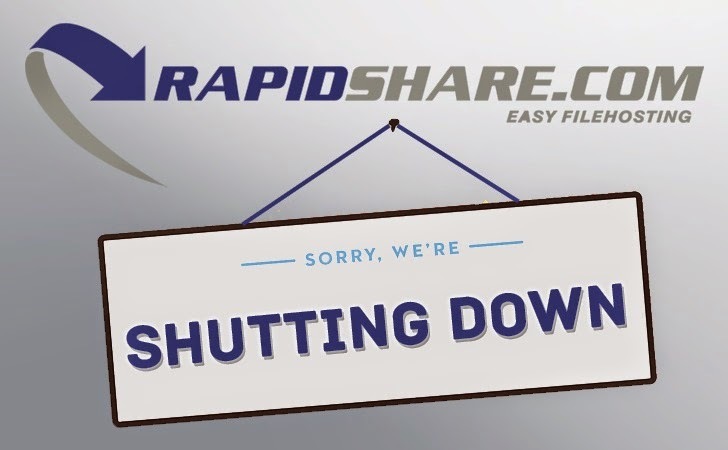 RapidShare file hosting service announced its shut down Tuesday through a notice on its official website, saying that it will stop active service on March 31, 2015. All user accounts on the website will no longer be available after this date, and all files will be deleted automatically. WHAT RAPIDSHARE USERS MUST DO ? "We strongly recommend all customers to secure their data. After March 31st, 2015 all accounts will no longer be accessible and will be deleted automatically," the notice on RapidShare official website reads. Just two days back, the most popular Torrent website KickAss Torrents banned by the .so registry (Somalian registry), forcing the site's operators to switch to another domain. Now, suddenly the oldest and popular file hosting service is closing up its shop. RapidShare, founded in May 2002, was widely used to share copyrighted content directly. In 2009, the site claimed to have 10 petabytes of files uploaded to its servers, and in 2010, it was said to have hundreds of millions of visitors per month, making it among the world’s 50 most popular websites. The reason behind the sudden shutdown decision is still unclear, however, the legal troubles related to copyright infringement have plagued the company for years. RapidShare has often been faced several lawsuits just like all other notorious file hosting services including The Pirate Bay, Megaupload and Isohunt, which all have been hit with legal issues for facilitating copyright infringement. While RapidShare worked to cooperate with the entertainment industry and even tried to rebrand itself as a personal cloud storage service in recent years by introducing a number of measures to discourage infringement. But at the end, its user base fell dramatically. It’s likely the site simply isn't as profitable as it once was. The reason behind the closure could also be the increasing competition with the other cloud storage services. We know that RapidShare cloud file hosting servers provides unlimited upload and download sizes, but the service does make you wait to download files if you are not its premium user. Comparatively, RapidShare charges roughly $680 per year for 300GB of space, while Dropbox charges just $99 a year for 1TB. MegaUpload, one of the largest file sharing websites on the Internet, was shut down in 2012 by federal prosecutors in Virginia, and the site's founder Kim Dotcom and three others were arrested by the police in New Zealand at the request of US authorities, conspiring to commit copyright infringement. The same happened in the case of The Pirate Bay — a widely popular torrent download website predominantly used to share copyrighted material free of charge, when TPB went dark from the Internet following a raid in Sweden. The raid was in response to a complaint from Swedish anti-piracy group Rights Alliance. The police raided The Pirate Bay's server room in Stockholm and seized several servers and other equipment. However, the infamous torrent download website The Pirate Bay (TPB) made a defiant return and finally came back online last weekend.